The Profile Manager allows your supporters to securely log in to Salsa and edit their own profile information (to update their address or email, for example). The Profile Manager is enabled by default, but it is entirely optional to make it publicly accessible to your supporters. Making the profile manager accessible to Supporters means that supporters can edit their own data in your database, so you're giving up some control of your records. What you gain in return is the ability for Supporters to manage their own group memberships, event attendance, donation, and action history all in one place. The easiest way to locate the URL for the Profile Manager is to log into the Salsa HQ and look for the Useful Links section on the dashboard. The URL is always available - you can decide whether or not you want to publish it to your Supporters. The first two features of the Profile Manage (Search for events and Group Membership) are found on the home page of the Profile Manager. Supporters enter a zip code to search for Salsa events in their location. Display public groups so that Supporters can manage their own group memberships. Supporters will see these public groups and be able to join or "un-join" them. Public custom fields (those marked as display to supporters in the custom fields manager). Shows instances of actions, campaigns, petitions, and letters to the editor acted upon by the supporter. Is it possible to modify the Profile Manager? I use some custom fields to replace some of the fields that the Profile Manager displays to supporters. I want to replace fields like the standard State/Province field with the custom field I use. Is this possible? While there's not a lot that can be customized in the Profile Manager, one possible solution would be to make a signup page that includes the custom fields and nothing else besides Email. 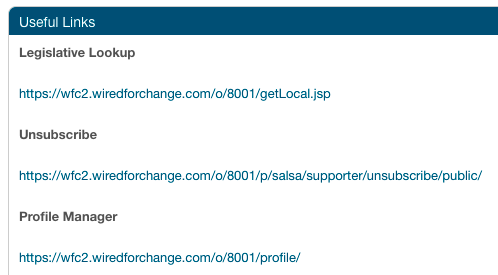 If supporters use the same email address to fill out that page as they already have on record, Salsa will update those custom fields with whatever the supporter provides on that page. Not an elegant solution, but probably the best bet if you want supporters to update custom fields in lieu of standard ones. Additionally, Salsa's Service team may be able to customize your profile manager to point to the custom signup page. Feel free to email us at training@salsalabs.com with more questions. I'm not seeing where to modify/update the Profile Manager. I'd also like more in-depth information on how it works because in testing right now, every button takes me back to the login screen. Thank you. There currently is no way to customize or modify the Profile Manager. Regarding your issue with being redirected to the login screen, can you please email support@salsalabs.com with a link to the area where you are working, and a description of what you are aiming to do? We'll take a look and get back to you. Thanks! This says the Profile Manager is enabled by default, but how do we disable it? We had a supporter confused about why there's an account and password for her email when she just signed a petition and didn't create an "account." We don't promote or link to the Profile Manager anywhere that I'm aware of, but she stumbled on it somehow, and I can see how that would be confusing. I would like to just disable it so our supporters are confused about having online "accounts" they didn't create. I am having the same issue as Lee. I would like to disable this feature so our supporters are not confused by references to an account/password they never created. Jake, I can't seem to open the link you posted; the message says I do not have access to the information and it may have been deleted. Could you post a new link or paste the explanation into this forum? Thank you! Didn't mean to lead you astray there! When I see this screen, I do not see a place to create a password. It either asks to enter a password or to signup. What about supporters who are signed up, but do not have a password? Although the wording is odd / uninformative, supporters in that position should click the "Forgot your password?" link. They will then receive a link in their email where they will be given a temporary password and be asked to reset the password to their own. Are there any plans in the future for us administrators to modify the Profile Manager settings/features? I don't believe there are any current feature requests to that affect, but you are free to submit feature requests any time. There is a current feature request related to the Profile Manager - you might want to add on to that thread. The feature to more work with this page should be available to us and we should not really have to request it.. We dont want to explain to our donators how to figure these things out, thats why we use Salsa. Could we at least get a "Get Password for First Time Login" page? I do not have the "First Time Logging In?" thing on my page as the above screenshot shows. And why is there a "Not Signed up yet" link, and how do we remove it? I cannot understand its purpose. You could accomplish the exact same thing (allowing users to create a new Supporter record or modify their existing record) with a sign up page. In this way you could allow users to create/update their data without requiring them to log in. Do you have an examples of orgs that are putting this feature to good use? We have someone who wants to raise money for us in an upcoming long-distance bike ride, but we're not sure it will be robust enough. She's interested in folks having the ability of being listed as donors and/or making encouraging comments through the page, like team-in-training sites and such. Just want to see what other orgs are doing. It sounds a bit like the profile manager isn't exactly what you need in your situation. You probably want to use the ' distributed events' feature, or perhaps you might be interested in trying the Grassroots features available in Givezooks. Although with both of those options, there may not be functionality that allows folks to make comments on the page (they can simply be listed as donors, however). Hopefully that helps! Thanks so much. I would like to entirely remove the welcome back message from our site but neither of the links listed by Jake (on April 3 and May 13, 2013) are working. I also followed the link to completely remove it in the "Hide the Welcome Back message" support topic (https://help.salsalabs.com/entries/25435090-Hide-the-Welcome-Back-message) and it doesnt work either. Every attempt to access the page says I do not have access to the topic. Please, is there an active link describing how to remove the welcome back message or could you copy and paste the relevant information into a comment below?